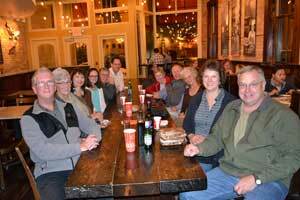 On Tuesday, September 17th, the Minnesota Sorrento Travel Contingent met at Punch Pizza, on Hennepin Avenue. All eleven of us gathered for some great pizza, and we shared conversation in preparation for our trip. After over a year of planning, the Sorrento adventure is about to begin! Tomorrow, I will depart Minneapolis with fellow travelers, Elena and Kelly. We will arrive in Naples, Italy, on the morning of September 26th, and we will spend our first night at Hotel Piazza Bellini in Naples. We are hoping to see a little of the city before returning to the airport on the 27th to meet the rest of our group. A few of the participants have already departed for Italy. A Minneapolis traveler, Jim, left the Cities on September 18th. He was scheduled to spend a few days in Florence, and then planned to join a photography class in beautiful Orvieto. Lucky Jim! All of us will look forward to the beautiful photographs he will create, and maybe he can share some of his new camera knowledge with the rest of us. And now, it's back to packing while thoughts of pasta, vino, and fabulous scenery fill my mind! It is difficult to believe, but my fellow travelers (Kelly and Elena) and I arrived in Napoli on Thursday, September 26th. It was a long day of travel, but everything flowed smoothly, and we arrived at our destination safe and sound. Elena is a charter member of the ICC, she has served on the Board, and is a current student in the adult program, as well as a supportive volunteer. Kelly studied Italian while in college, has traveled to Italy in the past, has been a student at the ICC, and she and her husband Peter, attend many of our events. The three of us are quite a trio, with an expanse in age...and a variety of personal experience. Thus far, we are enjoying one another and sharing in this fantastic opportunity! 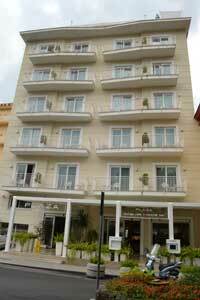 We spent our first night at Hotel Piazza Bellini, a wonderful hotel, in a very convenient location. I must say our journey to the hotel was a wild ride....in a taxi cab....reminiscent of such experiences I have encountered in New York City! If you have been there...in a cab...you know what I mean. Our rooms were lovely, and though we were exhausted, we managed to meander throughout "spaccanapoli", a narrow street which flows throughout the historic area of the city. It "splits" the city. Along the way were wonderful shops, small trattorias, and colorful people. 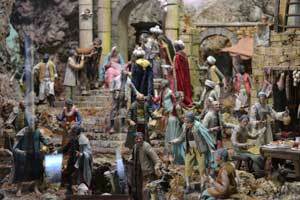 We saw many versions of the famous nativity scenes for which Napoli is famous. I am experiencing some problems with my iPad and posting on the Coordinator Page, so please bear with me and excuse any errors or strange occurrences! I am unable to thoroughly proof what I am posting. I think it may be iPad related. Back to Napoli....The nativity scenes I mentioned are called presepi in Italian. The bodies are made of wire, and the faces, hands and feet of clay. The costumes represent 18th century Neopolitan life, and they represent the life of the local, southern towns. They are crafted in numerous sizes, are full of detail, and far more extensive than any nativity scene I have observed in the U.S. They are simply fascinating, and it very easy to spend a good deal of time attempting to absorb every little detail. They extend well beyond the simple nativity scene we think of, including dwellings much larger than a stable, and figures representing many aspects of daily life. Our brief visit to Napoli ended all too soon, but we will return for one night, at the Hotel Bellini at the end of our journey. A delightful cab driver delivered us to the airport promptly at 11 am on Friday morning, September 27th. We located our shuttle driver, Gino, who was holding the "Gruppo Menaldi" sign in the arrival area. We waited with him until Nancy, my Florida instructor, appeared in the doorway. Several of us planned to take the shuttle to the school, and others arranged to arrive a little later. 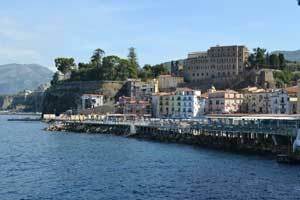 The trip to Sorrento was delightful, and the seaside views were, at times, breath-taking. Hotel Plaza was our destination, and it is located in the main square, Piazza Tasso. The hotel is modern, clean, and quite comfortable. We arrived on Friday, our first excursion is on Sunday, and classes begin Monday, so we have some time to become acquainted with our new surroundings. The group is becoming complete, little by little, and Nancy has been most accommodating. Elena, Kelly and I were fortunate enough to receive our own personal tour of Sorrento, with Nancy as our guide, and the entire explanation was recited in Italian! Nancy knows the city like a native, and she walked the streets three times, extending her generosity to everyone in the group. There are a total of 20 of us, 10 from Minnesota, and 9 from Florida. Today is Wednesday, October 3rd, and I have had little time to contribute to this blog! The days in Sorrento have been busy and full of new experiences. Classes began on Monday, September 30th, and we were expected at school by 8:45 a.m.
We congregated in the breakfast room at the hotel quite early. The breakfasts have been wonderful, with a wide variety of choices, and a wonderful, friendly staff. After eating, we walked to school, which is approximately one half hour away...a very nice way to begin a new day. The Sorrento Lingue setting is amazing, and the views out of nearly every window are stunning! The school overlooks the sea, so each morning our backdrop sparkles as the sun is reflected on the blue water. Shortly before leaving the US, each of the 20 in our group took an online language proficiency test, sent to us by the school. Our class placements were posted, and upon arrival we discovered where each of our classes would meet, and off we went. Our schedule will consist of 2 hours of grammar study ion the morning, from 9a.m. until 10:40. There is a short break of 20 minutes, followed by 1 1/2 hours of conversation. There are 7 students in my group, and it is the largest class. Margie and David, from Minnesota are in my group, and it will be great to share this experience with them, as they have been in some of my classes in Minnesota. They are very motivated to learn, as their daughter married an Italian man, and they live in Amsterdam with Margie and David's grand daughter. They are working hard to learn the language so they can communicate with their family in Italian! In addition, Peter is from Germany, Elena and Regina are from Russia, and America is from Florida. We are quite the international mixture, and what an exceptional experience this will be! We have discovered that our grammar instructor will be Domenico, assisted by Federica, and our conversation instructor will be Lucia. The subject matter for the first day is PRONOUNS! Is there anything worse? Soon, however, our room is filled with laughter, as we come to realize that Domenico is a fantastic teacher...probably the best any of us have ever experienced! He has made grammar, which is usually rather dry and boring, into something quite enjoyable...not an easy task. Conversation, with Lucia, is a lot of fun, too. I am beginning to realize how fortunate all of us are. I will close for today. There is so much to tell....over the weekend, we visited Capri, and in recent days, Mt. Vesuvius as well as Ercolano. Tomorrow, a cooking lesson is in store. We attend class each morning, followed by lunch, excursions, dinner, possibly some shopping, and little time for homework (I compiti in Italiano). If you would like to view some photos, please refer to our Facebook page. I am having difficulty posting them here. More later....Buona notte! A New Voice....And A Wild Ride! By now, some of you are, most likely, tired of learning of this Italian adventure through my eyes, so I have asked Elena to contribute to the blog. What follows is a new voice, and Elena will take us back to the streets of Napoli as she describes a wild ride. Here we go! 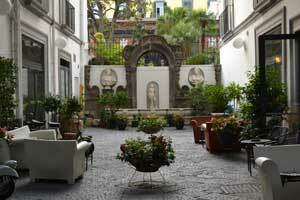 The distance between the airport in Naples and Hotel Piazza Bellini is not too long. On our way to Sorrento, Peggy, Kelly and I, decided to spend a day in Naples, the most Italian of all cities. A vibrant, bustling city, city of pizzas, narrow old streets, a romantic city with "washing hung" streets as seen in countless movies. A good plan was to take a taxi to our hotel. First, we had a conversation about prices. We had a fixed price given to us. The driver, and all the other drivers waiting for clients, agreed with our driver who was asking for twice as much! Tired, after spending a sleepless night aboard the airplane, we had no choice but to accept. The ride which followed was an unforgettable experience. The cab driver drove at break-neck speed, through the most chaotic traffic, very narrow streets, Vespas and motorcycles darting in and out from all sides. I could not close my window....Hot polluted air streamed into our cab. The driver tried to maneuver a very curvy, steep hill, and he suddenly began to back up, making an impossible u-turn. Apparently, there was an accident, or incident, ahead. 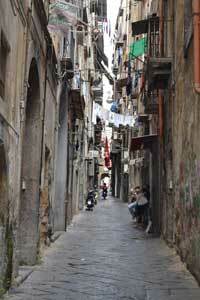 Our hotel is in the old part of town, the most atmospheric part of Naples, called "spaccanapoli" (split city). We found very narrow and dark cobble-stoned streets with vendors selling hundreds and hundreds of typical Neopolitan presepi, or Christmas cribs, and figurines. Some depict Christmas scenes and others village life. We visited a few churches, gothic or baroque, looked at statues and tombs, and found a pizza restaurant. We will be back on our return trip. Naples is almost too much to see. Perhaps we will venture into the subterranean Naples and see what lies beneath. With our group, called "Gruppo Menaldi", we will travel to the Museo Archeologico Nazionale to see the collection of Greek and Roman antiquities , many of them received from Pompeii and Herculaneum. 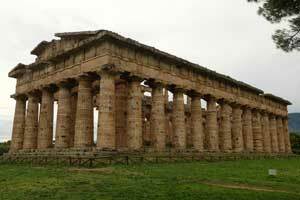 Today is Sunday, and several of us went on a guided tour to Salermo and Paestum. I was not familiar with either location, and the journey was most interesting. Before I get into the tour, I would like to share some of the death rituals Christina, our incredible guide, shared with us. When someone passes away, in this part of Italy, the best linen comes out and the body is placed in a bed at home. Friends and family are welcome to stop by to pay their last respects. It is important to point out that each body must be buried within a 24 hour period. All of this seemed rather unusual to me, and then Christina went on to explain that, after 7 years, a member of the deceased family must come to the grave to obtain the bones of their loved one. The bones must be washed (by the family member), and at that time, they are placed within the walls surrounding the cemetary. How foreign these rituals feel to me, and they are difficult to imagine. This evening, I discussed the subject with my Florida room-mate, Nancy. Her grandfather is buried in Portici, near Naples. Nancy explained that her father honored her grandfather by performing these rituals for him. His bones were removed, washed, and placed within the cemetary. Each day we are learning wonderful new bits of information, and today was certainly no exception. 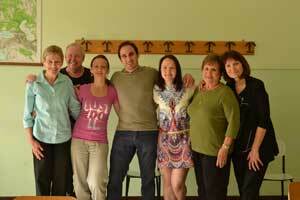 Early on, I mentioned that there were 20 participants in the Sorrento Adventure group.. I have already spoken a bit about my travel companions Elena and Kelly, and I have mentioned David and Margie who are part of the Minnesota contingent. It occurred to me that perhaps it would be worthwhile to mention the others. Eleven members of the group hail from Minnesota. In addition to those mentioned above, Brian and Jim are also students in the ICC group language classes. Jim was in the Navy some years ago, and he was stationed in Naples. He has an interest in photography, and arrived early on (as I shared some time ago in this blog), to take a photography class in Orvieto. Naples has changed since his military days, and he was unable to find many of the posts that were familiar to him. Brian is of Italian descent, and from the sounds of it, has spent a good amount of time in this colorful country searching for his roots. Jane and Paul were recruited by Margie and David. Jane is Margie's sister, she and Paul travel extensively, and Jane has an interest in languages. She speaks Russian. Gina and Bob reside in the Twin Cities area, and they live in the same neighborhood as Jane and Paul. As I noted in an earlier posting, Nancy escorted a group of adults from Florida, in May of 2012. When contemplating a Minnesota version of the Sorrento adventure, we anticipated the need for some Florida participants to round out our group. Nancy never imagined it would be necessary to turn people away! There are 9 travelers representing the southern state. The list contains Grace, Terry, Nancy #2, Phyllis, America (yes, that is really her name), Victor, Julie, and Fran. Fran is a student in my conversation class in Florda, and I might add hat she has a beautiful voice! Snow birds are common here, although some reside in Florida year round. Most of the Florida contingent have retired, I like those of us from the northerly state. I am frequently astounded by how diverse a group we are. We are from all walks of life, and our range in age is wide. One would think those of Italian descent would dominate....however, such is not the case. We share a passion for Italy, for one reason or another, and most of us are determined to learn the language. On a sunny afternoon, October 3rd, 25 students from Sorrento Lingue boarded a train that took us to Ercolano. We were from Florida, Minnesota, two you g women from Russia, and one gentleman from Germany. Ilaria was our guide. She did research for her dissertation on the archeology of Ercolano and was a very knowledgeable and delightful guide. Ercolano (Herculaneum) was founded in AD 79 by Hercules. It was a small town of 8000 which had numerous craftsmen and rich and cultured patricians who settled there because of it's beautiful location overlooking the Bay of Naples. Ercolano was destroyed by the same eruption of Vesuvius which destroyed Pompeii. In Ercolano, the people were burned and buried by a sea of mud, whereas in Pompeii they were suffocated by the lava. Of particular interest are timber structures , beams, and doors which are preserved by a hard shell of solidified mud. Ercolano was discovered by a farmer, in the mid eighteenth century, who was digging for a well. 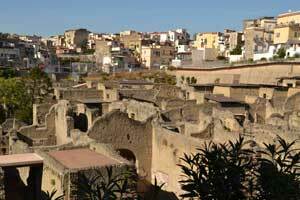 The archeological site is relatively small because the modern city of Ercolano had been built above the archeological site and can not be excavated. It is not known how many other buildings remain buried under a very deep layer of ground. Beyond the entrance to the site, an avenue passes through the ruins of dwellings of different owners. One still boasts a mosaic pavement , and just beyond on the left, is a house which had a wooden trellis and another one containing a wood burned partition. Beyond stands a dyer's shop known for it's superbly preserved wooden clothes press. The "terme", or bath house, of Ercolano are in excellent condition and show a remarkable degree of planning. 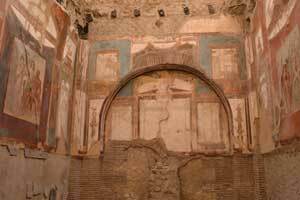 In the men's bath is a cloakroom with frescoes on the ceiling and a Sepidarium. The women's baths include the waiting room, the cloakroom adorned with mosaic pavement depicting Triton, and a Sepidarium with a mosaic floor. The terme had an amazing arrangement to heat water for the baths. There are simpler structures and a grocery store. A house is equipped with a shop, it's counter opened to the street. The blue-green mosaics , depicting Neptune and Amphitrite, adorn the rear living quarters . The bakery was complete with oven. Flour mills contained huge pots for soups and stews and this might have been the first fast food restaurant. The range of different buildings and their excellent state of preservation, as well as a relatively small size of excavations, make Ercolano a wonderful archeological site to visit. We all enjoyed our visit. A Typical Day in the Life of a Sorrento Lingue Student.. The weather conditions during our second week in Sorrento are a bit more unstable than our first days. We have been experiencing outbursts of rain, at times it has been quite heavy. It has been quite an experience to tread to school, about a 20 to 30 minute walk, on slippery cobblestone streets. We were all looking foward to attending a sagra (local festival) in a small village this past Tuesday evening. We waited for the local bus, for some time, only to discover the sagra had been cancelled due to the inclement conditions. Nancy told me this usually doesn't occur until the winter months. It seems I bring Minnesota type weather wherever I travel! Yesterday, as usual, we attended class from 9 am until approximately 12:40. There was a movie, "Il Diavolo Piccolo" scheduled, at the school, for 2 p.m. I have been trying to take advantage of every opportunity, so I grabbed a panino at the local salumeria, and off I went. The movie was spoken in Italian, with Italian subtitles, and the film included Roberto Benigni and Walter Matthau! The subtitles were quite easy to read...unlike many other films I have viewed, and it was quite helpful to see the Italian language in written form as it was spoken. It was a silly little film, with a rather strange ending. The film ended at 3:45, and at 4:00 we were due at a local gelateria for a class in gelato making. Theresa, the owner, gave each of us a silly white hat, and escorted us to the basement where they create 80 flavors of gelato.....unbelievable....and it is SO good! She demonstrated how to make lemon sorbet, as well as hazelnut gelato. Some of the group participated in the process, and an hour later, each of us had eaten THREE cones--the lemon sorbet, hazelnut, and the last of our own choosing. This was indeed a record for me, and I loved it! A bit later, a group of us met for dinner. The place, whose name escapes me, was located on an upper floor and the atmosphere was quite nice. My selections for the evening consisted of the local fish (sea bream) and the house salad, which included tuna and corn. A highligh of the evening was hearing a member of the Florida contingent sing. An accordion player stopped by our table (a common occurence), and he and Francesca were able to sing a couple of Italian songs together. Fran has a beautiful voice, and enjoys singing whenever she can. The entire room burst out in applause following each selection. What a lovely day...and there are more to come! 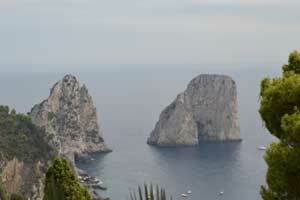 Our first day trip took us to the island of Capri on September 29th, a day after our arrival in Sorrento. Capri has long been a retreat for emperors, artists, writers and the international jet set---a luxury playground of the first rank. Ernesto, our guide, let us at the hotel and walked us to the marina, descending a staircase which seemed to be hundrends of steps. We boarded a crowded hydrofoil, and after a pleasant crossing in the Bay of Naples, arrived at the Marina Grande in Capri-- a small, colorful harbour. We made our way, through hordes of daytrippers, to our bus which took us to the island's highest village of Anacapri. Our bus ride on a dramatic corniche road offered spectacular views of the island, the coast, the cliffs and bays. It was almost a funicular climb and Ernesto called it the "Mamma Mia Road". The entire island measures only 2 miles by 4 miles. We passed houses of many hues, surrounded by lush vegetation. At the top, some of us dared to climb into a chair lift which took us to the top of Monte Solare, Capri's highest point. From the chairlift, we saw wild and lonely places even though the island is very crowded. On top, a thick fog rolled in from the sea, and we did not get to see the spectacular panorama which we looked forward to. After the chairlift ride, some of our group visited the 15th century Villa San Michele, which used to be the house of Axel Munthe (1857-1949), a Swedish pysician and author of the best selling "Story of San Michele (1929). The gardens and the views, particularly from the garden terrace, were magnificent. We returned to the "Mamma Mia Road" to the larger village of Capri and were dropped off at the Piazza Umberto which is the center of town, and the place where crowds gather. Here we had free time for a couple of hours. Some of the group took a boat ride around Capri to see impressive cliffs, rocky inlets eroded by waves, and to take a look at Tiberius Leap, the impressive cliff from which Emperor Tiberius is said to have thrown his victims. Others went to explore the winding and steep alleys, and to do more shopping. We met at the piazza, under the clock, at an agreed time and returned by hydrofoil to Sorrento. Paestum is southern Italy's most evocative archeological site. Three almost perfectly preserved Doric temples, which are considered the greatest in the Greek world, finer even than those in Greece. Much of Paestum's charm also derives from it's tranquil setting--a big meadow filled with wildflowers. Only 7 of us went on a wonderful two hour bus ride to the site. During the ride, Christina gave us a lesson on Greek and Roman history and painted a perfect picture of life in Paestum. Before coming to Paestum, we made stops on the way. First, we drove through Vietri Sul Mare, a village celebrated for it's ceramics. The factory is covered with a pattern of ceramic tiles which we admired from our bus. Our first stop was in Salerno, a busy port best known as one of the main Allied beach heads where the 5th U.S. Army landed in September of 1943. Our day began somewhat cloudy, and the morning was perfect for a visit to the Duomo which looked like a medieval castle. It was dedicated to St. Matthew the Evangelist, who is buried in the crypt. The Norman-style building has a square tower and was remodeled in the 18th Century and again after it was damaged in the 1980's earthquake. The church is preceded by an arcaded courtyard built of multicolored stone with ancient columns. The square tower has Moorish tiles under it's roof and the bronze doors were cast in Constantinople. The interior was large, has an iconostasis which encloses the chancel, commonly found in Byzantine or Greek churches. There is also a Crusader's chapel where the Cursaders had their arms blessed. We took a walk through the old part of Salerno, with it's picturesque streets which had a medieval character. It was Sunday, so most shops were closed--except one--a man's hat shop. We did not enter the shop, as none of us were in need of a man's hat. We pondered the existence of such a shop, and smiled at a gentleman wearing a hat behind the sales counter. He nodded, givinng us permission to take his photograph, and afterwards, we proceeded on for refreshments at a coffee bar. Our trip continued through rich agricultural land parallel to the coastline. Christina was telling us that big farms employ immigrants from Eastern Europe or Africa to do farm labor. The work is hard and labor cheap. One more stop was made at a buffalo farm and mozzarella factory. We saw water buffaloes wallowing in a muddy pond, munching on straw. Christina bought lovely fresh mozzarella for her family supper, we had a taste of the cheese, and shortly after, arrived at Paestum. 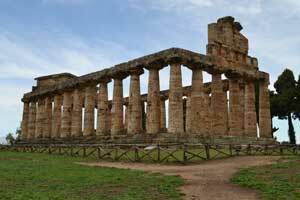 One of Italy's most important archeological sites, Paestum was discovered by chance in the 18th century, when the Bourbons started to build the road which crosses the area today. The first settlement was an ancient Greek colony, founded around 600 B.C. under the name of Poseidonia. It was absorbed by the Romans in 273 B.C., but began to decline and was abandoned following ravages of malaria. It lay hidden amidst jungles of cypresses for hundreds of years, when road excavations brought the magnificent temples to light. The temples, built of a yellow limestone, stand amidst ruins of dwellings. We entered through a city wall and followed the principal street of the Greek and Roman city. The grandest, and best preserved, of the temples is the Temple di Nethune, whose columns and pediment have survived nearly intact, but the roof is missing. Next stands the Temple of Hera, sister of Zeus, also known as the Basilica, after being wrongfully identified by the archeologists. At the site's northern extreme stands the Temple de Ceres, dedicated to the goddess Athena. The temple combines a mix of styles; the Doric columns are solid and massive whereas the internal Ionic columns are more graceful. To the East stands the amphitheater which has been divided by the main road. It is usually located outside a city center to enable the flow to and from the amphitheater. We left the site and had a good lunch. Local specialities we selected were a Caprese salad and a sort of pancake filled with mozzarella. Our final stop was a visit to the Museo Nazionale, a museum of finds from the site. It's most treasured exhibits are wall paintings of the Tomb of the Diver (480 B.C.). These pictures may be the only surviving examples of Greek mural paintings from that period. Four of the paintings show a funeral banquet and the songs, games, musicians, and former companions that accompany the deceased into the next world. The fifth panel, which formed the coffin's lid, shows the most famous of the paintings - a naked diver, diving into the blue sea. The scene may be an unusual allegory of the passage from life to death. An Experience To Top All Others! Well...what is the first thing to come to your mind when you think of Italy?? Could it be a gondola in Venice....an aria from a famous opera......or the crazy drivers you may find on narrow Italian roadways...? All of these things sound marvelous, don't they? The country is so full of so many amazing things, but there is something else on top of the list for many. Could it be the delicious cuisine this country is noted for??? I have yet to discuss what was probably the most unique and enjoyable activity arranged for us. During our 2 plus week stay, we were invited to Villa Pane for a cooking lesson and dinner. And this was not a one shot try...We were actually invited twice! We were going to experience Italian cusine, at Villa Pane, on two occasions; each on a Friday afternoon and evening, from 4 until 8 p.m.
On that first Friday, we boarded mini vans, and our shortish journey out of Sorrento began. There were more than 20 of us, so a stream of vans headed for the villa. Along the way, we stopped. It became apparent that it was necessary to leave these vans, and quickly, we realized we were about to move into some sort of vehicle which was considerably smaller than the initial vehicle. These "vans" were tiny! In a few moments, the reason for the change became crystal clear....The roadway was much too NARROW to accommodate the larger vehicle! We sped our way up the winding hill until we stopped just below Villa Pane. Anna Maria, the owner of the establishment, welcomed us eagerly at the door. In short order, we were served a cherry torte as well as a cherry flavored beverage to go with it. We made our way into a dining room type area, where an unbelievable experience was about to begin. On this first visit, we were to learn to make the famous limoncello, salsa di pomodoro fresco, parmigiana melenzane, scialatielli alla Siciliana, and tortina cioccolato! Now that your mouths are watering, you will begin to understand what a lovely evening this was. How funny that we would concoct limoncello.. Prior to our departure, the MSP travel contingent made limoncello of our own! Of course, we thought we were experts...and that no one's limoncello could surpass our version! It was lots of fun, as every one of us began to zest the real Sorrento lemons...and put together some authenticl Italian limoncello. We completed part one on this first visit. This was only the beginning...We went on to prepare the rest of the menu items, and each of us became involved in the process. If you see photos of Davide...and have the impression he looks more muscular since this trip, you are probably correct! His job was to knead the pasta of the area (scialatielli) to perfection, and this was no easy task! Anna Maria was an exceptional hostess. Villa Pane not only hosts classes in Italian cusine, but there are rooms for rent, dining is possible, and there are gardens and farm animals to visit on the property. It is easy to see why she is such a success. Anna Maria was most cordial, and very entertaining...as was her colorful staff, including another Anna Maria, Paola, and Adele. It is difficult to put all of it into words. When everything was ready, we all sat down for dinner. At some point, Fran (who I have mentioned can sing), sang for us. Everyone in the kitchen came out, joined in with us, and were touched by it all. It was well after 10 when we left....which I believe exlpains it all, giving you a picture of these Itaians, and their wonderful appreciation for living. I will write a brief description of Cooking, Part 2, in my next note. Of course, all of us were looking forward to our second visit to Villa Pane. That first experience was exceptional, so who could resist returning for more?? This time, we would complete...and sample...our limoncello, create Caprese salads, tiramisu, and pizza Napoletana FROM SCRATCH!! I have to mention that the ride up this time was just as interesting. We moved from larger vans...to smaller ones. Brian was amongst a numer of others in one of the vans....At one point, the driver realized he could not make the trip up with so much weight on board. Out on the road went Brian....and he walked the rest of the way up! Step two in the limoncello process was completed, and the samples were great. They use 95% alcohol, while we use Everclear (believe it or not)! Some thought the "real" Italian version was milder, while our recipe is stronger. In any event, it was fun to concoct in both instances. Creating the pizza's, and other items, was once again delightful. I have never seen so much dough in one place, and each of us had our own "ball" to knead and form into a crust...after some time to rise, of course. Anna Maria has an oven in her back yard...and the pizzas came out one after the other.....after the other....after the other....after the other. There is no doubt now that I...and my energetic travel companions....have gained weight since September 27th! There was no end to the number of pizzas, and it was difficult to turn any of them away! The remainder of the meal, including the Caprese salad and Tiramisu, were deliziosi...Again, Fran sang, and we ate and drank wine until well after our 8 pm scheduled departure time. What an extraordinary experience...and what warm, generous people Anna Maria, GianLuigi, and the remainder of the staff are. If ever I return to Sorrento, Villa Pane will be on my agenda. The outline of Vesuvius is an intrinsic feature of the Neopolitan landscape. From Sorrento, Vesuvius is across the Bay of Naples, and all along the Amalfi Coast, one has magnificent vistas over turquoise waters to the volcano. Some of us have visited Pompeii and Herculaneum--a climb to summit of the volcano would make the picture complete. On Wednesday, October 2nd, a small group (with strong knees) set out to climb Vesuvius. We boarded a train which brought us to the base of the mountain. Italy has higher and more active volcanoes - namely Sicily's Mount Etna. None is as notorius as Vesuvius, where catatastrophic eruption in AD 79 burned and preserved the Roman towns of Pompeii and Herculaneum. People living in the Bay of Naples, in the first century BC, knew all was not well with Vesuvius. Earthquakes, years before the fateful eruption, had ravaged the region and given warning of the subterranean forces. More immediate warning was days before the catastrophe, when the volcano began to smoke and rumble, ignored by the population. The volcano, after all, had not erupted in recorded memory. It all changed on August 24th, AD79, when the cone's ancient plug collapsed. Gas, pumice, and other debris were released with an explosion, and a vast cloud blotted out the sky. Pompeii was immediately buried by dust and hot cinders. Inhabitants were asphyxiated by super hot gases. Soon all the volcano's inner wells collapsed, unleashing further destruction, including a torrent of boiling volcanic mud--which engulfed Herculaneum. The most recent eruption was in 1944, during World War II--another is just a matter of time. Our ascent to the top of the volcano began from the vicinity of Ercolano. We first boarded a heavy bus which brought us to another starting point. Then we climbed into another very heavy all terrain vehicle, which could handle a very narrow and rough path further up. From there, we began our final climb, by foot, to the summit. The path was well laid out, in the middle of lava flows. The climb was most impressive, scattered with cinders and lava rocks. A rope, along the way, kept us on the path and could be used as a railing. From the summit, there was an immense panorama over the Bay of Naples and beyond the Gulf of Gaeta. The crater was immense, and is an unforgettable sight for it's size and sense of desolation on the slopes of it's jagged walls. We walked along the gargantuan crater, and I noticed a small spouting stream jet on one side of the crater. The descent to the vehicle took about 45 minutes. This was certainly another memorable day! After a final whirlwind sweep through Naples, Elena, Kelly and I arrived back in Minnesota. On that last night in Naples, the Hotel Bellini was waiting for us, and on this occasion, our cab driver was a delight! He spoke no English, and it was fun to share a few words of Italian with him. After all, the ink on our Sorrento Lingue diplomas was still wet! Our room, this time, was cute and cozy...consisting of two floors. There was a double bed on the lower level, and in the loft...atop a wooden staircase...were twins and a very nice-sized bath. We managed to wander more around the hotel, and discovered all kinds of nooks and quaint little spaces. It is a it larger than I originally thought, and I wouldn't hesitate for a minute to stay at the Bellini again. We wandered from the hotel, to an area near the water where we could catch one of the red, double-decker buses. I have done this kind of thing in other cities, and have always thought it was a great way to get the feel of a place, especially when short on time. We were able to ride on two of the three routes, one of them taking us through the heart of the city and up to Capodimonte. We stopped here, and were able to view one of Caravaggio's famous works. Our next stop was to sample the famous Neopolitan pizza. On a Sunday afternoon, this place was bustling...and let me tell you, the pizza was delicious. Later on, we traveled the route which wound along the sea. The vistas were stunning, and we were able to view another side of Naples. We ended the evening with a light meal and our last serving of gelato. Naples is a bit rough around the edges, but full of character at the same time. In closing, I feel I've got to emphasize the "academic" portion of this journey. After all, it was our main purpose for traveling! I can not say enough about Sorrento Lingue, the administration, staff and instructors who make learning la lingua straniera so enjoyable. Each day, we entered the building and were greeted by numerous, smiling faces. During grammar and conversation sessions, we studied with other students from around the world. We learned together, laughing and sharing life experiences. The instructors, who are dedicated and passionate about their country, brought the Italian language to light for each of us. They are a talented group. The additional activites and excursions were no exception. All of them were well organized, with the desires of their students at the top of the list. They have a good thing going at Sorrento Lingue. One in our group summed it up in one word...Phenomenal! I have asked myself what it is I have gained through this experience, and the list is long. I was able to study a beautiful language, in the country of it's origin. Travels took me to settings bursting with history and full of beauty. I learned how the Italians make gelato, process olive oil, create intarsia masterpieces, cook, sing and enjoy living. The setting was spectacular, and the staff at the school-- amazing. For a short period of time, I was able to feel like a true student of Italian...Getting up each morning to prepare for, and then walk to school, was reminiscent of college days in the past. Not only did I become more acquainted with my Minnesota counterparts, but I made new friends from Florida, Italy, Russia, Germany and Washington D.C. I discovered that the world is truly quite small. All of us will treasure memories of one September in Sorrento.